The origin of the name, Chess Pie, is uncertain, but there are plenty of guesses and a bit of folklore surrounding the name. The most probable explanation is that since the English lemon curd pie filling is very close to lemon chess pie, and they believe the word “chess” is an Americanization of the English word “cheese,” referring to curd pie. Basically the Chess Pie is a cheese-less cheesecake. One suggests that the word is “chest,” pronounced with a drawl and used to describe these pies baked with so much sugar they could be stored in a pie chest rather than refrigerated. Another story is about the plantation cook who was asked what she was baking that smelled so great – “Jes’ pie”was her answer. 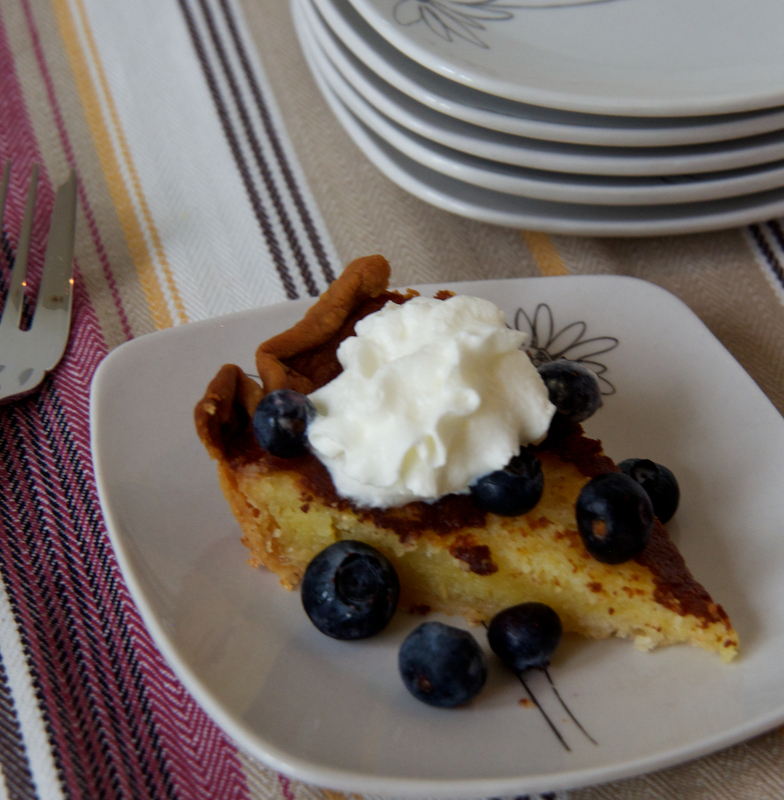 For me, chess pie began with my grandmother, a great cook who made everything from scratch with farm fresh ingredients that had been gathered minutes or hours before. Her chess pie is a simple combination of butter, eggs and a little milk baked in the flakiest ever crust. Fortunately, my mother made the pie one of her standbys and now it continues with me though I must confess to having made a few changes. I don’t always make a crust as Pillsbury does a pretty good job of that, I use different vinegars, butter is melted in the microwave rather than whipped in and to dress it up a bit, I serve each slice with a dollop of whipped cream and a few berries on the side. Even with the changes, the end result is almost as tasty as I remember Grandma’s being. Line 9″ pie pan with crust, crimping edges. Line pastry with aluminum foil and fill with pie weights. (I use small stones.) Bake at 425° for 4 to 5 minutes. Remove weights and foil; bake 2 more minutes or until golden. Remove from oven and reduce temp to 350. Stir together sugar and next 7 ingredients until blended. Stir in eggs, one at a time and blend well. Pour mixture into pie crust. Bake at 350° for 50 to 55 minutes, shielding edges with aluminum foil or pie shield after 10 minutes to prevent excessive browning. Cool completely on a wire rack. Whenever you plan on serving this pie, you may want to make an extra one because most everyone will ask for a second sliver. It’s one of those desserts that tastes so good and is much more than jes’ pie. Enjoy! I rediscovered Chess Pie a couple months back and fell in love with it all over again. Blueberries take this delicious treat way over the top, YUM!!! Oh yes, it is more than jes’ pie………..it is my favorite thing on the planet!!!! yum!! I make a lemon chess pie every year for the bake sale for our school. It is always one of the first ones to go. Delicious!! I’ve eaten this pie many times and like it a lot. Never did know where the name came from. Thanks!!! The pie tastes even better than it looks! fun Lulu! I like the “Jes’ pie” explanation! I bet your pie was divine! I always associated chess pie with the Amish. Looks good, but I’ve never had it. I’m always up for a good pie. Mother made a chocolate one, too, that I didn’t learn. You’ll have to share. We are going to just love this pie, it looks fabulous! Hope you are having a great week and thanks so much for sharing with Full Plate Thursday. Your non cooking friend will only dream of home cooked food until you return to West U.